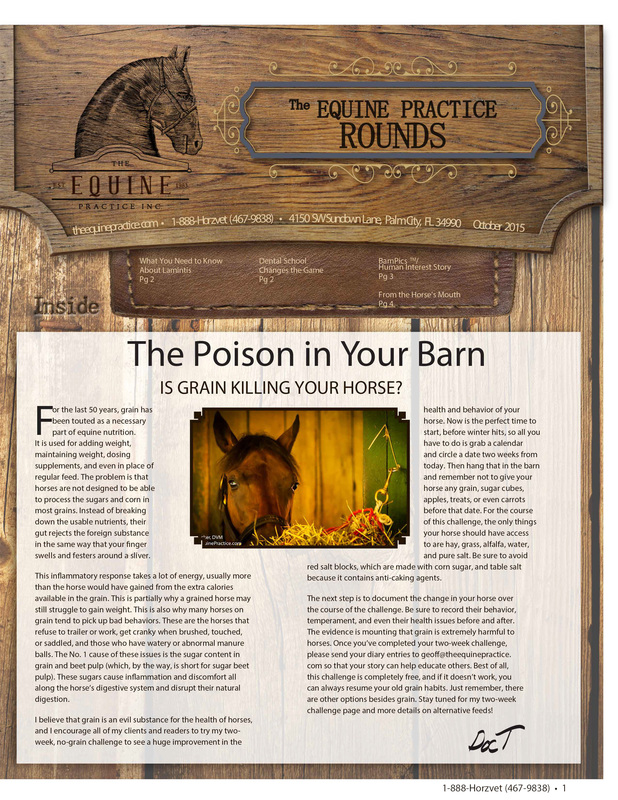 The Poison In Your Barn – is grain killing your horse? Computer (BEST) – Click the button below marked PDF version then follow the prompts. Opens in a new tab. NOT recommended for phones or tablets. Computer (alternative) – Click an image below and it will open in a new window then click that image once to enlarge and click again to shrink. Scroll about the image as you would normally do. Click your back arrow to return to this window and then repeat for the next image. Tablet or smart phone – Do NOT tap the image. Use your fingers to expand and move the image. If you accidentally tap the image, it will open in a new window. Use your fingers to expand and move the image then press the back arrow to return to this page. “On his way to Idaho” is a wonderful story. Hats off to his owner – and to you Doc – for taking the time to come to understand him. As with humans, all living beings have their unique experiences and imprints that affect who they become over time. This horse deserved the respect, kindness and sensitivity that was given to him. All animals do – as do all humans. Lessons in compassion offer so much – all we have to do is listen with an open heart. Thank you Doc! do you know anything about side bone or ring bone you can explain and how to deal with it. Love your column. I’m glad you enjoy it. Yes I do know something about it. 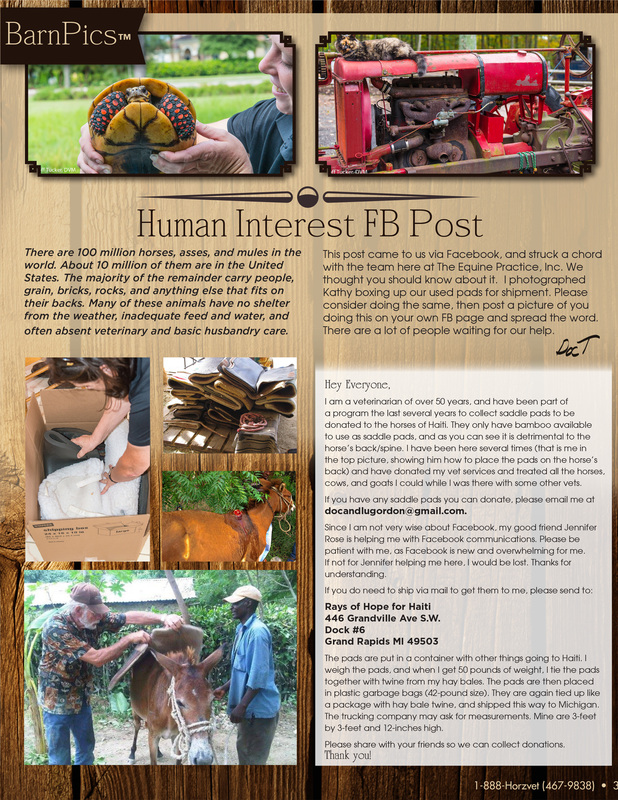 Check out http://www.TheHorsesAdvocate.com and see if that might be something you would be interested in. Some years ago, I was shocked when my day-to-day vet commented that beet pulp was high sugar Since it was made of sugar beets because all previous sources had recommended it as a low sugar feed for IR horses. Then, U. Kentucky came to the rescue with a webinar about horses with equine metabolic disorder. I don’t remember whether beet pulp is not made from sugar beets or whether it is what is left over after the sugar is taken out, but they specifically said those were misconceptions and recommended it as one of the best feeds for horses on a low sugar diet. That would be the no molasses added kind that you soak. Be careful of beet pulp in prepared feeds as they often add molasses in lieu of your soaking. If you didn’t know it was beet pulp, you would probably guess “hay” from the composition. My first experience with beet pulp was 55 years ago – as a hay substitute for a horse with heaves. This mare was able to come into “the barn” (dusty-with dirt aisles, no turn-out, 24 stall, wood, built in 1895 as the equestrian center for Biltmore House) and live on beet pulp and no hay – for years. In addition, it is cheap and the horses love it. I also feel that sugar beet pulp is a byproduct and the manufacturers of it created the market with horse owners to create another income source for themselves. I am not against business making a profit, but why are we feeding our horses a byproduct? In my association with horses over the past 4 decades, my observation is that we humans are trying to change everything with horses. And now I see the effects of sugar on their behavior. With more clients willing to take the 2 week no-grain challenge and sharing the positive results, I am becoming more convinced that for the majority of horses (not all), removing sugars from grain, and yes, sugar beets, is in the best interest of horses. This is a common question. There are plenty of non-grain pellets (hay pellets) that some water can be added to mix up the supplements. Hay cubes also work. Most importantly, allowing the gut to go without any supplements for 2 weeks should not cause any harm to any horse. Then, after the gut has had a chance to heal, add back the supplements in a non-grain base. If your horse was prescribed Vit E by your vet, then talk to him or her first before doing this. Vit E is usually in an oil base so it should not cause inflammation especially in the small amount given. 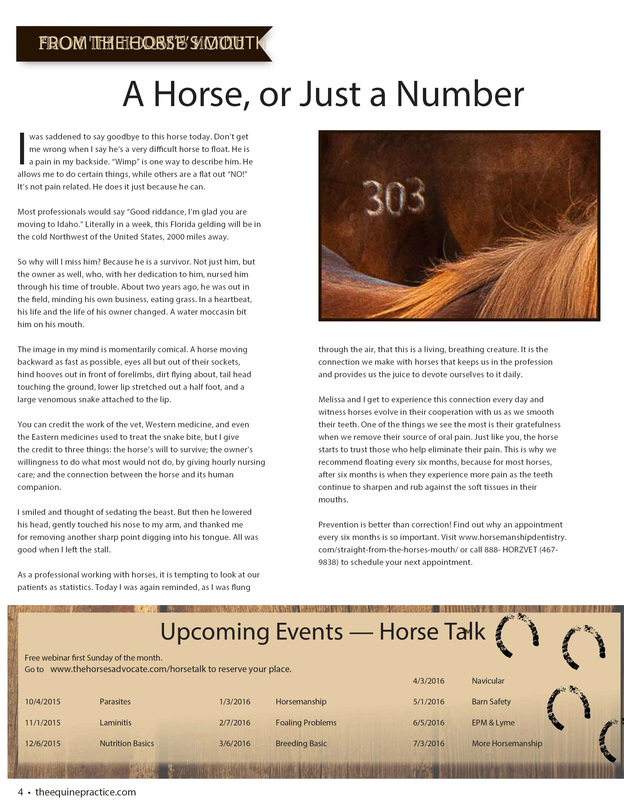 Really great posts this month that go straight to my heart: (i) stop the grain!, (ii) what really causes or induces laminitis, (iii) often forgotten working animals (we support The Donkey Gambia Trust), (iv) how relationships really matter. Keep teaching: you will succeed individual by individual. See you at AAEP in Vegas? Hi Geoff, It’s been a while. 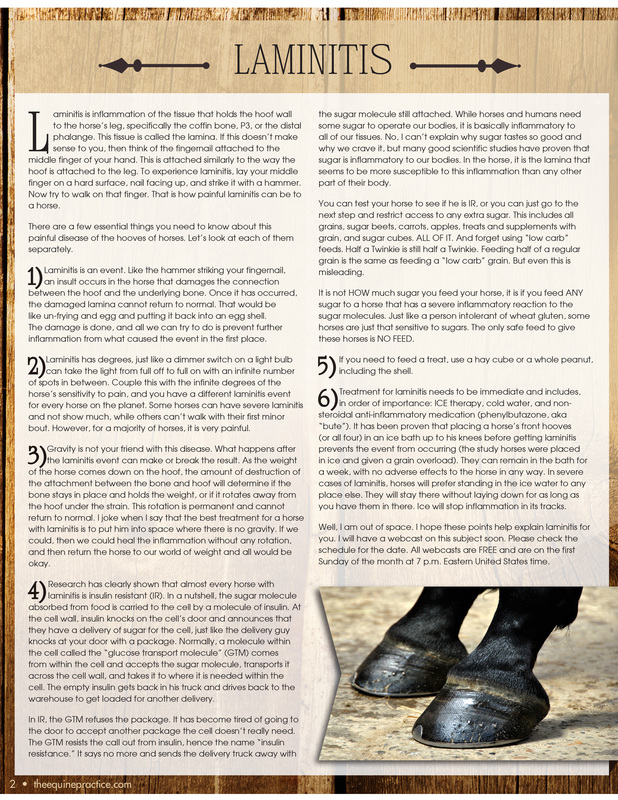 I loved this newsletter, especially about grain and laminitis. Ha, I don’t have to take the 2 week no-grain diet. At age 24, I took my thoroughbred, Hapsburg, off the little grain that was left in his diet. I had been reducing and reducing and got left with a very small amount for him because I had it in my head that thoroughbreds have such a fast metabolism that they are the exception and need some grain. I switched him to chaffhaye and rice bran and really, to my surprise, he did not lose weight and is actually still thriving, now at 26 years old. He still eats a tonne of hay and a horse has to be well hydrated to eat that much hay or they can’t produce enough saliva to chew all of it. I hope you remember “Hap” from years ago. He’s the one with the flabby cheeks! This is an amazing point regarding grain feed.I have had a horse who also had huge issues with tying up and all this was do to grain feed high in cereal content.Removing the grain and replacing with more hay eliminated this issue in a very short period of time. Thanks John – Horses that tie up (severe muscle cramps that are painful and debilitating) should never be fed sugar / grain. They do much better with a diet low sugar hay and fat. Several horses cannot tolerate pasture due to high sugar content. This has beed associated with a genetic defect found in the DNA sequencing that dates back to the Crusades where horses were bred for large muscle mass to carry the weight of armored knights. A fascinating subject. Older horses need special care when floating, especially if it has been a while and the teeth are sharp. I have learned to be very conservative and to do a little over several visits. One thing worth mentioning is that horse’s teeth do not grow. They erupt like the lead inside a mechanical pencil. And like that lead, when it is used up, there is no more. At 29 years, the teeth get close to end-stage and stop erupting. Only over time will the tongue strop the teeth and develop a new edge for him to grab onto the food. Until then, find out what he likes to eat and what he can eat. It is now a management issue between him and you. At least his teeth don’t hurt him anymore. He just needs to re-learn how to manipulate the food within his mouth and this takes time and experimentation in finding the right feed consistency. Thank you for the reply. I’ve been reading that it is best to float by hand especially in the senior horse. I wish I didn’t use her. Happy Thanksgiving. All materials produced by Geoff Tucker, DVM by Geoff Tucker, DVM is licensed under a Creative Commons Attribution-ShareAlike 4.0 International License. Permissions beyond the scope of this license may be available at https://theequinepractice.com/copyright/.